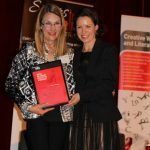 Philomena Horsley (Northcote, Vic), a medical anthropologist who specialises in autopsies, took out the 25th Scarlet Stiletto Short Story Award presented on Saturday night (24 November). 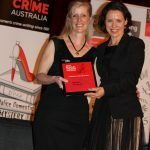 Actor Kate Atkinson and author Cate Kennedy presented the awards before a hundred crime fans at a gala ceremony at Melbourne’s Thornbury Theatre. Pairs of stilettos with flowers adorned every dinner table. Large stiletto cut-outs decorated the Velvet Room. Many women rose to the occasion by wearing red (or black) stilettoes. 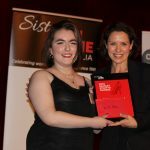 Horsley was awarded the Swinburne University of Technology First Prize ($1500) for “Darkness in the Port”, a story about domestic violence and Jazz, a young and homeless girl who roams the streets of St Kilda and Port Melbourne, surviving on the goodwill of local characters and the bookish nutrition of regional libraries. Horsley was also presented with the coveted stiletto trophy, a scarlet stiletto shoe with a steel stiletto heel plunging into a mount. Horsley said that back in May she was down at her Otway shack, sitting at her computer trying to do some “real” work, when the story just demanded to be written. “The first draft was done in just one day, and then I just needed to go back to Port to check out my memory of the setting – it’s where my Mum lives,” she said. 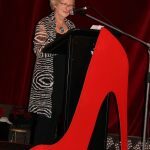 Short story guru Cate Kennedy, winner of the first two Scarlet Stiletto Awards in 1994 and 1995, made an hilarious presentation, entitled ”These heels are made for walkin’”. She admitted that she’d never been a girl to wear stilettos. “Firstly, because I have size 11 feet, and most stilettos made in my size are designed for drag queens and feature a lot of patent leather. Also, having shoes that pinch and stop you running across the street has always seemed a bit of an impediment. Which is why these shoes I’m wearing tonight are actually orthopaedic Homy Peds, from their formal range. I don’t get out enough to justify wearing anything else. Kennedy also presented the highly commended certificates and later launched Scarlet Stiletto: The Tenth Cut (Clan Destine Press), an e-book of this year’s winning stories. Kate Atkinson, who presented the major awards, also had the audience laughing during her interrogation about her ‘life in crime’ (and much more) with Jane Clifton, actor, musician, crime author, marriage celebrant and Sheba driver. This year 201 stories competed for $9,760 in prize money plus the scarlet stiletto trophy. Twenty-three authors were shortlisted for a total of 13 awards. Nineteen shortlisted authors attended the awards ceremony. Phyllis King presented the Judges’ Report: “Some of you will be aware that in past years, the judges have been surprised by a theme which has run through a number of stories e.g. one year involved cats in various guises and, another year, mothers strapped in their babies and headed out to investigate. We have seen disposal of unwanted husbands in a multitude of imaginative – and often painful – ways. Journalist and author Fin J Ross (Paynesville, Vic) snared an astonishing four awards. Her story “Deadly Ernestine” took out the Simon & Schuster Second Prize ($1000), the Melbourne Athenaeum’s Body in the Library Prize ($1000) and the inaugural International Association of Forensic Linguists Award ($1000). Another of her stories, “Victory of Kyrnos”, won The Clan Destine Press Award for Cross Genre ($500). Cheekily, the murder in “Deadly Ernestine” occurs in the Melbourne Athenaeum Library. 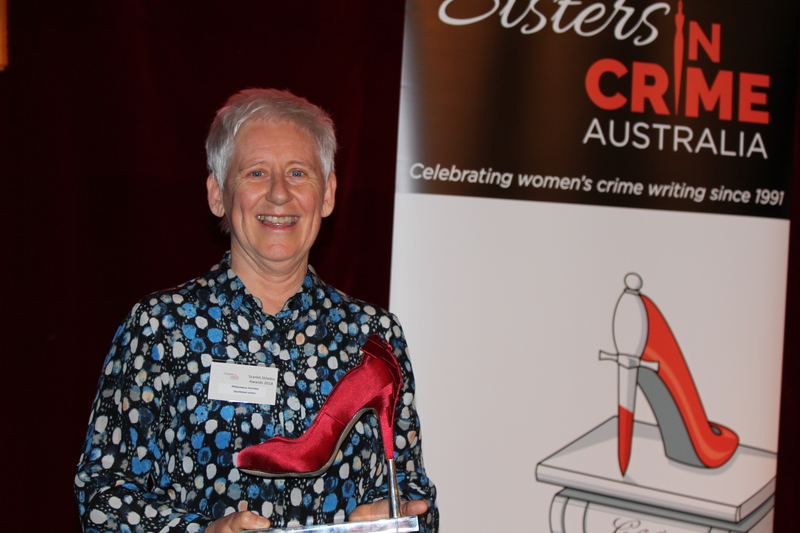 Ross has co-authored two true crime books and has won numerous prizes in the Scarlet Stiletto Awards. She is working on her first crime novel. Ross also runs a boarding cattery to make ends meet. It was also a bumper night for Kat Clay (Footscray, Vic). Her story, “Lady Loveday Investigates” won the Kerry Greenwood Malice Domestic Award ($750), the Sun Bookshop Third Prize ($500) and the Athenaeum Library Body in the Library runner-up prize ($500). Clay is the author of Double Exposure. In 2017 and was longlisted for the CWA Debut Dagger award for her unpublished novel, Victorianoir. 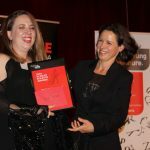 The Every Cloud Productions Mystery with History Award ($750) was awarded to Jenny Castles (East Brunswick, Vic) for “The Poe”. Castles has worked as actor and is now an editor for children’s books and a ghost writer for adults. She is the author of four picture books and co-authored a book about the final days of Ned Kelly with her late father. 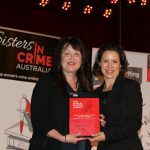 A brand-new award, the Writers Victoria Crime and Punishment Award for the story with the most satisfying retribution, went to Lisa Louden (Larrakeyah, NT) for “Starfish under Falling Water”. The prize, worth $660, is a three-month residency at Old Melbourne Gaol. 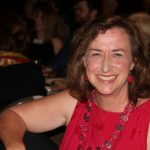 A former television and radio news producer, journalist and editor, Louden, a former Melbourne resident, has also worked in corporate communications and volunteered as MD of an animal foundation. She’s currently writing her first novel and has just completed a Curtis Brown Creative course. The Harper Collins Romantic Suspense Award ($500) went to Sandi Wallace (Mt Dandenong, Vic) for “Fire on the Hill”. Wallace took out the same award in 2016 and has won a number of other Stiletto awards over the past six years. She is currently at work on the fourth instalment in her rural crime series, along with a standalone psychological thriller. Fifteen-year old Olivia De Lesantis (Thornbury, Vic) won the Fleurier Consult Young Writers’ Award ($500) for “Wayward”, a story set in 1930s’ Collingwood. She is an aspiring crime writer and ardent feminist. 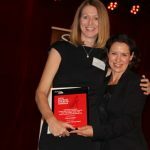 The Scriptworks Great Film Idea Award ($200) was won by Helen Richardson (Faulconbridge, NSW) for “The Stand-In.” Helen is a part-time editor and freelancer. Her stories have been published in Sleepers’ Almanac, The Great Unknown (ed. Angela Meyer), The Big Issue Fiction Edition and Pigface and Other Stories (ed. Ryan O’Neill), amongst others. She is currently working on a YA novel. Highly commended were: Beth Amos (Palmerston, ACT) for “Katherine”; Susan Bennett for (Warragul, Vic) “Denial” ; Robyn Boston (Caloundra, Qld) for “Rose and Frank”; Jan Bull (Toora, Vic) for “Missing”; Bridgitte Cummings (Adelaide, SA) for “The Wither Tide”; Dawn Farnham (Perth, WA) for “The Widow’s Library”; Alison Ferguson (Eleebana, NSW) for “Fragments of Meaning”; Christine Goonrey (Bega, NSW) for “An Invisible Presence”; Annie Hauxwell (Castlemaine, Vic) for “AFP”; Kerry James (Wendouree, Vic) for “Homing Pigeon”; Kate Jenkins (North Hobart, Tas) for “Vengeance Bay”; Lisa Jordan (Canadian Bay, Vic) for “Missing”; Dorothy Shorne (Melbourne, Vic) for “Welcome to the Neighbourhood”; Paulene Turner, “The Infiltrator” (Greenwich, NSW) ; Ellen Vickerman (Carindale, Qld) for “The Chatterbox Criminal History Weekday Walking Tour”; Sandi Wallace (Mt Dandenong, Vic), for “Duplicity”. 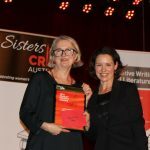 The judges decided not to award the Liz Navratil Award for Best Story with a Disabled Protagonist ($400), sponsored for a 5th year by the Queensland Chapter of Sisters in Crime. Scarlet Stiletto: The Tenth Cut (ed. Phyllis King), a collection of the 2018 winning stories, are available from Clan Destine Press as an e-book for $4.00: lindy@clandestinepress.com.au or Itunes, Amazon and other platforms for $4.99. Prizes were kindly sponsored by Swinburne University; Simon & Schuster; The Sun Bookshop; The Melbourne Athenaeum Library; The International Association of Forensic Linguists; Kerry Greenwood; Every Cloud Productions; Harper Collins Australia; Writers Victoria; Clan Destine Press; The Queensland Chapter of Sisters in Crime and Scriptworks. 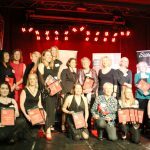 The 26th Scarlet Stiletto Awards close on 31 August 2019.